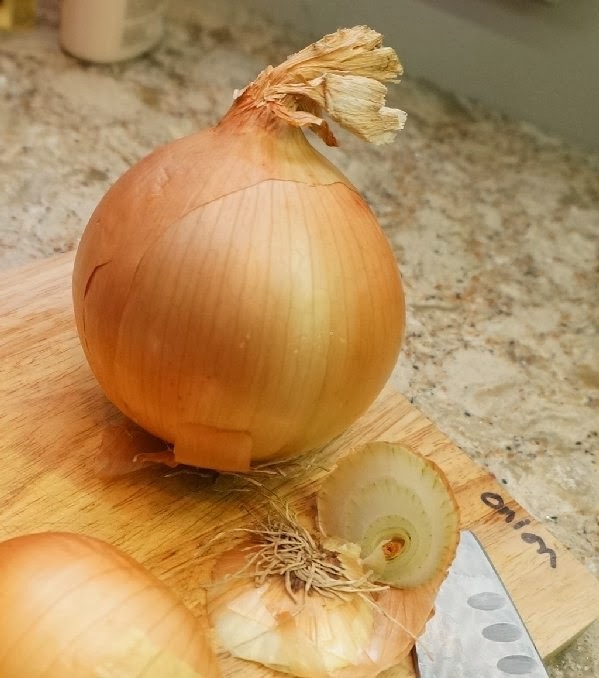 There are a lot of different tips out there for chopping onions efficiently and without tears. Today I thought I'd share my tried and true method. I always start by cutting off both ends of the onion, I cut the onion in half from stem to root. The onion skin is then easier to remove. 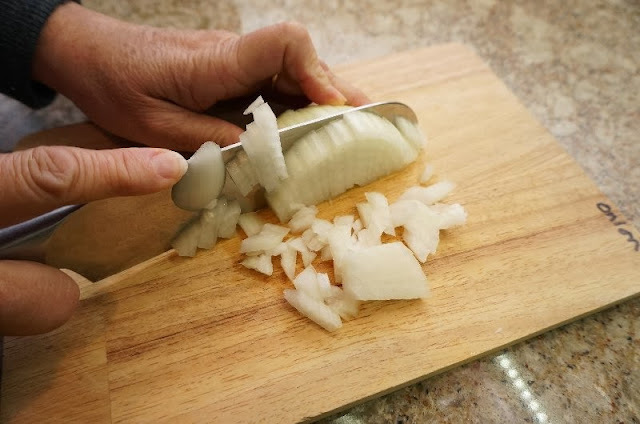 turn the cut onion 45 degrees and cut it the other way forming a dice. As you can see from this picture, I have printed the word ONION with permanent marker on one side of my cutting board. In dedicating one side of a cutting board to onion I avoid having the onion taste transfer itself to the milder fruits and nuts I might need a chopping board for later..
Just a few tips on a Saturday morning. Thanks for stopping by and enjoy your day. Super great idea ... thanks for sharing this one. Bev, this is the way I do it too and it works. My eyes never tear. That is a great idea! I once ruined a whole watermelon by cutting it on a board which I had used recently for onions. I've tried setting aside one board for meat and onions but I'm forever turning around and seeing my husband using the others for them...maybe if I'm even MORE direct and write ONION and MEAT on the board he will join me in my attempt to save the watermelon! I chop the same way...Your idea about marking the board is a great one. Why didn't I think of that? I freeze onions whole..then on the rare occasions that I need to use onions, I get them out of the freezer, peel and chop. No tears! Great tips! Thank you. I never thought of turning on the exhaust or opening the window. I have heard that wearing glasses helps. I also love the marking of the board....great idea! I have 4 rectangle and 2 oval cutting boards. I have always used the plastic ones because I want them to be able to go in the dishwasher.. The oval are only for onion...it helps others remember...O=onion. The simplest solution is buying the frozen chopped onions! I've been doing that for a LONG time as my eyes always burned BIG TIME every time I had to chop them. LOVE those frozen chopped onions. OK, just tried it with the back door open and exhaust fan on & in between the two. Cut both ends off, in half root to stem and my eyes were watering and burning big time. Guess it can't work for everyone. Thanks though--was worth a try. I wrote onion and garlic. those two are dedicated to one board. 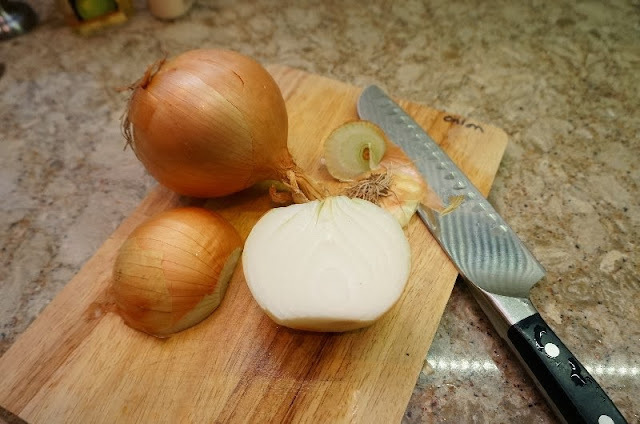 I love all your tips - The Oval board for Onion is great! And frozen chopped onions? Are theyavailable in the supermarket? I don't think I've ever come across them. thank you for taking the time to share your methods with us. We have the greatest readers! Yes the frozen chopped onions are available in every grocery store I shop at and they are SO worth it! After trying the different methods used by various chefs, I always come back to chopping onions this way. Any other way is awkward for me. As for the fumes, I open the kitchen window and hope it helps. I too label my boards with a permanent marker, I have Veggies only, and meat only on each side of the board. Then I have another for fish!